Picture driving around North Carolina in a stylish compact SUV that can handle all of your daily driving tasks with ease. At Vann York Toyota in High Point, NC, motorists have the opportunity to explore all of the latest Toyotas including the 2016 Toyota RAV4. Our dealership is one of the state’s top-ranked Toyota dealerships and serves Thomasville, Lexington, Asheboro, and Burlington, NC. Stop by Vann York Toyota at 500 Eastchester Dr. today and discover the new RAV4 today. For 2016, the Toyota RAV4 has undergone a thorough update that makes the compact SUV even better. The RAV4 gets a sleeker appearance thanks to new exterior colors, LED taillights, optional LED headlights and new wheel designs. For a more comfortable ride, the new RAV4 obtains all of the latest technology and a variety of interior features. To excel in a variety of driving situations, the new RAV4 has a peppy motor. The compact SUV is equipped with a 2.5L four-cylinder engine that makes 176 hp and 172 lb-ft of torque. The engine is matched to a six-speed automatic transmission that puts the power down to the front wheels or all four through an available all-wheel drive system. When adequately equipped, the RAV4 is capable of returning a combined fuel rating of 26 mpg. The compact SUV segment is heating up with a lot of competition, but none have the same styling, interior features and capability as the 2016 Toyota RAV4. To get our best price on a new Toyota, visit Vann York Toyota in High Point, NC. We’re proud to one of North Carolina’s premier Toyota dealerships serving Greensboro, Winston-Salem, Kernsville, and Jamestown, NC, and have a vast assortment of vehicles for drivers to explore. 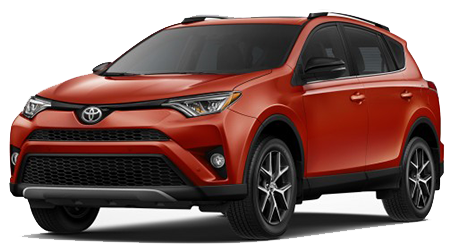 Stop by Vann York Toyota at 500 Eastchester Dr. today and explore the new RAV4 today.